As Chris Pratt finishes up his work on Avengers: Infinity War, the actor is set to make his return to the world of LEGO next month as he begins voice recording sessions for Warner Bros.’ The LEGO Movie Sequel., which sees him returning as everyman minifigure Emmett. Speaking to Gizmodo to promote the release of Guardians of the Galaxy Vol. 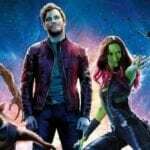 2, Pratt offered a brief update on the status of the sequel, and confirmed that it will deal with the introduction of the ‘real world’ in the original film’s final act. One way of dealing with it would be to have the characters entering the real world, although Chris McKay – animation co-director of The LEGO Movie and director of The LEGO Batman Movie – has previously said it’s going to be “this big musical and space action movie”, so at this point it’s anyone’s guess as to what the plot might entail. The LEGO Movie Sequel is set to be released on February 8th, 2019 and is being directed by Mike Mitchell (Trolls).